This blog post discusses ageing and the politics of mortality in North Korea. It emphasizes the importance of historical legacies, the presence of important veto points (e.g. military and party nomenklatura), the role of the industrial-military complex, as well as country-specific patterns of political authoritarianism in shaping the survival of Kim Jong-un’s regime. It also highlights the central role in institutional change played by other concomitant factors, such as those linked to war and nuclear escalation-related amenities with associated politics of mortality. The role played by power politics dynamics, emergence of new social status-conflicts and the strategic use of public policies in authoritarian survival is also emphasized. Because of ongoing and complex processes of political, economic, cultural and societal restructuring, where new social risks emerge (Armingeon & Bonoli 2006), the challenges for North Korea are even more serious and pressing than the ones that other Western nations are called upon to face. 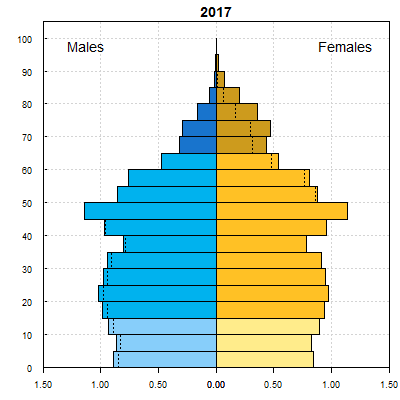 North Korea is not only confronted with similar demographic pressures as other Western societies are (such as ageing population). It is also forced to deal with more dramatic systemic problems. They stem, on the one hand, from the transition from a centrally planned to a mixed-market economy. On the other, they derive from the negative occurences that the North Korean population is called upon to deal with the negative occurences because of war and nuclear proliferation activities (see my other blog posts here and here). Problems of Democratic Transition and Consolidation (see Linz and Stepan 1996; also O’Donnel and Schmitter 1986)1 become here more pressing. The North Korean society is ageing. 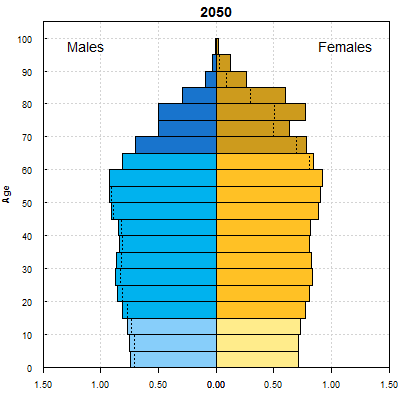 According to the United Nations (UN) Population Division (2017)2 (see Figure 1), the number of people aged 65 and above will double by 2050, and will continue to rise until 2100. Source: United Nations, Department of Economic and Social Affairs, Population Division (2017). 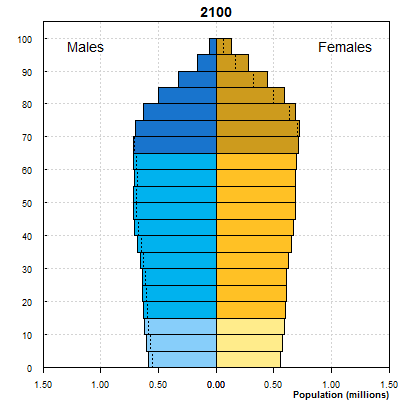 World Population Prospects: The 2017 Revision, custom data and figure acquired via website. 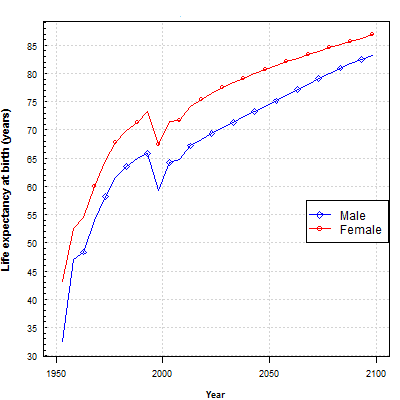 Low birth rates associated with an increase in life expectancy are the major causes for these demographic developments. 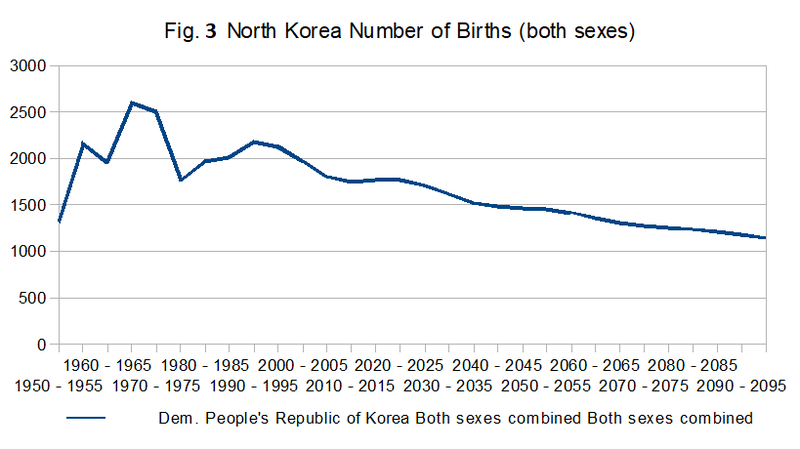 North Korea is expected to witness a constant increase in life expectancy followed by decrease in the number of births (see Figure 2 and Figure 3). As shown in Figure 4, these societal changes have important repercussions for public policy making. 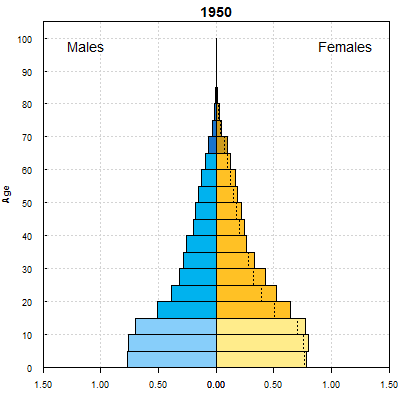 Different population pyramids need different policy responses. Needless to say, this has also important consequences in terms of politics of inequality (Cerami 2013)3, politics of anger management (Cerami 2015)4, as well as the associated distributive conflicts (Haggard and Kaufman 2016)5. As shown in Fig. 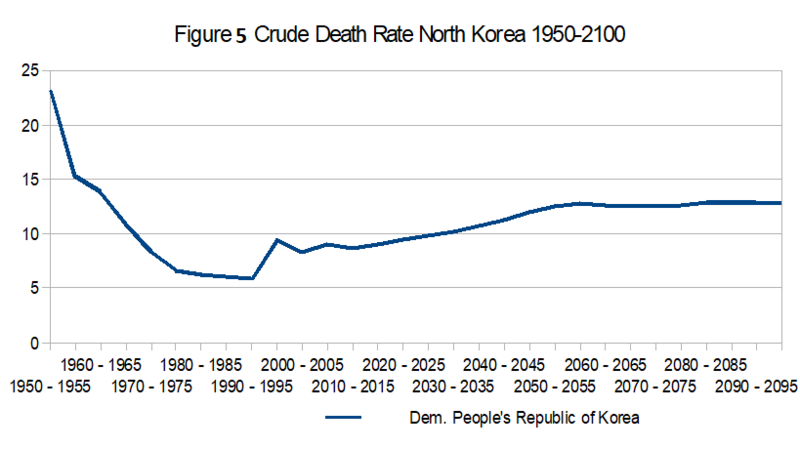 5, after a significant decrease in the deaths between the period 1950 to 1990, the crude death rate of the North Korean population is expected to grow until 2100. However, this trend, already negative, does not fully take into account future amenities of war and of nuclear proliferation, such as those linked to famine and the increase in war-related fatalities and illnesses. A recent article in The Lancet, one of the world’s leading medical journals, has highlighted that rapid mass privatization has been one of the most crucial determinants of differences in adult mortality trends in post-communist countries, accounting for up to 1 million lives. The authors (Stuckler, King, & McKee, 2009)6 have explained the main reason for this increase in mortality rates as caused by the captured nature of privatized resources by oligarchs (see also Novokmet et al. 2017)7 and by other former communist party members (including their sons). Though real mortality rates remained often a state secret during communism (Vlassov and Vishnevsky 2017)8, the capture of resources has fostered further stages of political and administrative corruption. This has led to the re-emergence of different mafia organizations, with a subsequent increase in inequality and mortality rates. Interestingly, the negative effects of rapid privatization were reduced if the social capital of citizens was high. This was clearly the case of former members of the communist elites. Notwithstanding, when more than 45 per cent of the population affected by rapid mass privatization was part of at least one social organization, such as church or trade union, privatization was no longer significantly associated with increased mortality rates (Stuckler, King, & McKee, 2009). Slow privatization also helped to reduce mortality rates and vulnerabilities (Azarova et al. 2017)9.
Who are then the real winners of contemporary North Korea’s buyngjing line? As argued in one of my previous blog on North Korea’s communist social structure, the origins of dictatorship and democracy are both exclusive, as well as inclusive (see here). Co-optation and changes in distributive conflicts here make the difference in fostering authoritarian survival. In the North-Korean State-Interfered Planned Market Economy, in which military elites not only capture resources but also redistribute benefits among the population, the communist nomenklatura, personnel employed in the industrial-military complex (including the scientists in the nuclear industry), the nouveaux riches (The Donju) and The Mafias are the real winners of Kim-Jong-Un’s new path towards dictatorship. These are, in fact, the social classes that succeed to capture higher social capital and, therefore, will not be subjected to the increase in mortality rates. Due to the failure of the North Korean medical system (including lack of medicines) (UMG 2017)10, a new health diplomacy can be introduced (Horton 2017)11, though this should follow a de-nuclearization of the country. For North Koreans, it is therefore self-evident that establishing democracy, as well as a functioning free market economy become a matter of life and death against Kim-Jong-Un’s new politics of mortality. 1Linz, J. J. and Stepan, A. (1996) Problems of Democratic Transition and Consolidation, Southern Europe, South America, and Post-Communist Europe, Baltimore and London. : Johns Hopkins University Press. O’Donnel, G. and Schmitter, P. C. (1986) Transitions from Authoritarian Rules, Baltimore: Johns Hopkins University Press. 3Cerami, A. (2013), Permanent Emergency Welfare Regimes in Sub-Saharan Africa. The Exclusive Origins of Dictatorship and Democracy, Basingstoke: Palgrave Macmillan. 4Cerami, A. (2015), Social Protection and The Politics of Anger in the Middle East and North Africa, Social Policies (Politiche Sociali), 1, pp. 115-135. 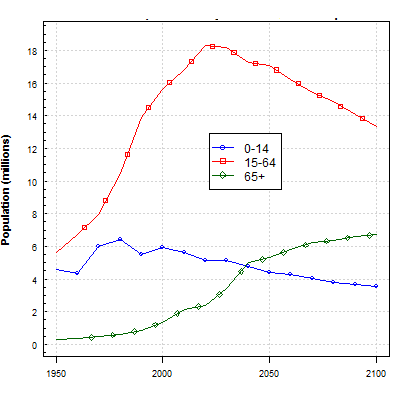 6Stuckler D,KingL,McKeeM(2009).MassPrivatisationandthe Post-Communist Mortality Crisis: A Cross-National Analysis. The Lancet 373: 399–407.